Home Moto Márquez: "I expected to be better, I still do not have all the strength"
Márquez: "I expected to be better, I still do not have all the strength"
The Repsol Honda rider continues to demand despite having led the first day of testing: "I had to change my riding style to compensate." 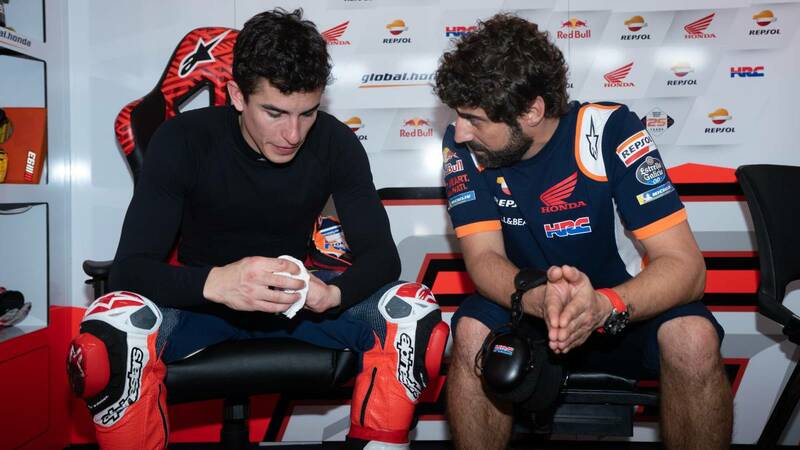 He ended up leading the first day of the test despite not being recovered one hundred percent, but Marc Márquez is not satisfied. The Repsol Honda rider is not feeling as well as he thought: "I am very happy to be riding again after a long winter, but expected to be better than I am, I still do not have all the strength, for one or two laps I'm fine , but I had to change my riding style to compensate. We stopped earlier, to reserve for the rest of the workouts, because there are still two days left and we will see how I am ". Marc is as demanding with himself as with his team He also has not been satisfied with the improvements he has noticed on the bike: "Honda has been working very hard these months and we have tried some new features, but the list is very long, we are analyzing the most important ones The bike is already at a good level , but there are always things to try before arriving in Qatar ".